Aligning oneself openly with Trump's movement sends an aggressive political message. Before he encountered Omaha elder Nathan Phillips at the Lincoln Memorial, Covington High School student Nick Sandmann had already taken steps to provoke and insult people of color. He'd put on a MAGA hat. Sandmann’s face went viral over the weekend when footage began circulating of him and his classmates at the Lincoln Memorial. The moment has become something of a political Rorschach test that also raises thorny questions about the way various perspectives become amplified and even weaponized on social media, sometimes without the benefit of important facts. Context is key; this is something both conservatives and liberals can agree on. But in this case, that context must include what the teens were wearing — and what that apparel has come to represent. Context is key; this is something both conservatives and liberals can agree on. But in this case, that context must include what the teens were wearing. Sandmann was in Washington D.C. with his all-male Catholic school classmates to participate in the March for Life. But the clip that rocketed across social media depicts a smiling Sandmann standing toe to toe with Phillips as the latter beat a drum and sang a traditional prayer song. The facts of the confrontation remain in dispute, and various other, longer videos have since surfaced providing more context for what happened before and after the moment immortalized by social media. The original clip did not show, for example, the Covington students being harassed by a small group of Black Hebrew Israelites. It also did not show the Covington students appearing to mock Phillips with stereotypical war whoops and tomahawk chops. For his part, Sandmann — who is now represented by a PR firm — has said he meant no offense, and tried to "remain motionless and calm" because he believed "a group of adults was trying to provoke a group of teenagers into a larger conflict." Sandmann also presents himself and his schoolmates as apolitical participants in someone else's protest. "We were simply there to meet a bus, not become central players in a media spectacle," he says. "This is the first time in my life I've ever encountered any sort of public protest, let alone this kind of confrontation or demonstration." The teen doubled down on his statements during an exclusive interview with "Today." "I mean, in hindsight, I wish we could've walked away and avoided the whole thing," he said. "But I can't say that I'm sorry for listening to him and standing there," he added when asked if he felt he owed anyone an apology. But this characterization is misleading. Sandmann and his classmates were making a political statement as soon as they wore their MAGA hats in a public space. Aligning oneself with Trump's movement is an aggressive political statement. It's difficult to believe the students — who were after all in Washington for a political march — were unaware of this. Rebecca Jennings at Vox says that teens love MAGA hats because they are transgressive. The hats, she says, can have different meanings for different people. That's no doubt true. But it's also true, as Jennings acknowledges, that kids wear Trump regalia, or invoke Trump's name, in order to bully and insult immigrants, Muslims, black people, Jews, Hispanics, or members of any of the other marginalized groups who Trump himself regularly attacks. It's not just kids, either. Journalists at Reveal identified more than 150 incidents in 39 states over the 18 months since the inauguration in which people invoked Trump's name while taunting or attacking people from marginalized groups. “I told you to pack your bags. You might not be here tomorrow," a ninth-grade boy wearing a MAGA hat told a classmate of Muslim and Mexican descent on the day after Trump's election. Two days later a gay man in Michigan was taunted that "Trump is going to get rid of people like you." The incidents were particularly prevalent after Trump's victory, but they have continued throughout his presidency. Trump has provoked more organized expressions of hate as well. Radical right groups now wear MAGA hats as a form of provocation and intimidation. Trump has provoked more organized expressions of hate as well. 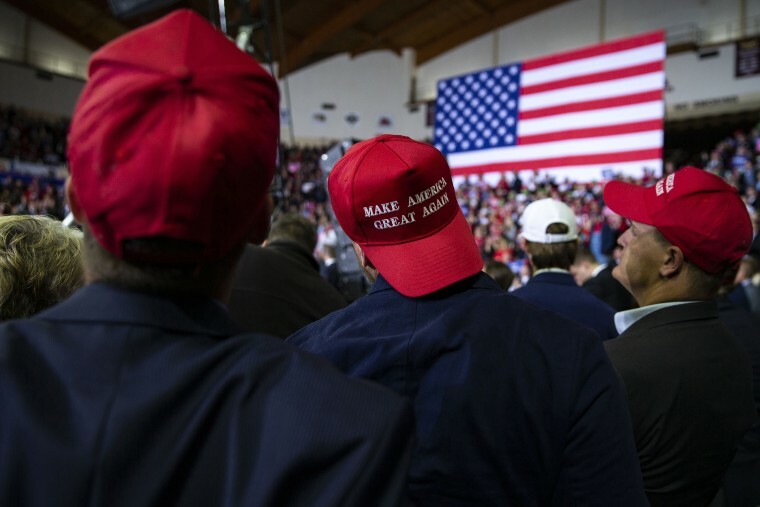 Radical right groups now wear MAGA hats as a form of provocation and intimidation, according to David Neiwert, author of “Alt-America: The Rise of the Radical Right in the Age of Trump.” The hat is symbolic of both Trump the man, and Trump’s MAGA platform, which routinely mocks and attacks minorities. "They clearly see Trump as an inspiration," Neiwert says. "They use his name when they commit hate crimes. And so the hat is very much a designator of that." Neiwert says he's seen MAGA hats at alt-right demonstrations. They are particularly popular with the white nationalist, virulently misogynist, violent all-male organization, the Proud Boys, he says. "The Proud Boys wear them constantly." Obviously, not everyone who wears a MAGA hat is a member of a far-right gang devoted to street violence. Nor does everyone who wears a MAGA hat insult or attack marginalized people. But everyone who wears a MAGA hat should know that they are associating themselves with Trump's exclusionist, angry rhetoric. Everyone who wears a MAGA hat should know that many marginalized people see the hat as a symbol of hate. The Covington kids may have just been wearing the hats to provoke onlookers, or to show their solidarity with the president. But just like wearing a Confederate flag T-shirt, or taking a "joking" prom picture with everyone's hand raised in a Nazi salute, actions have reactions. You can insist that you don't see it as a symbol of intolerance. But you're essentially daring people to disagree with you. You're daring people to be offended. This affects the nature of any encounter even before words are exchanged. MAGA hats are far more prevalent than Confederate flags or swastikas, which makes it impossible to stigmatize their use the way other symbols of intolerance have been (at least partially) stigmatized. Trump has blurred the lines between partisan Republicanism and bigotry, so that the first becomes little more than a hollow mask providing deniability for the second. The rise in hate crimes since Trump took office is disturbing. But what's even more dangerous is the way that signaling intolerance has become normalized, unremarkable and uncriticizable because of its association with the president. Remember what MAGA means: "Make America Great Again" is a call for an America without all the people Trump despises. "In the good old days this doesn't happen, because they used to treat them very, very rough," he sneered at a rally in North Carolina, encouraging supporters to attack protestors. America was great when Trump fans could hurt others — especially non-white others — with impunity. Phillips said that when he was in the crowd he felt like the students wanted "to have the freedom to rip me apart." That may not have been the message Sandmann wanted to convey in the moment, but it's nonetheless a reasonable interpretation of the hat he chose to put on. After the students began to move away to their buses, Phillips stopped drumming and raised his arms in the air. "Relatives! " he said. "Relatives! Let's make America great. Let's do that." He pointedly did not say "make America great again;" there has never been a time in the history of the United States when this country was great for indigenous people. Instead, Phillips was calling on everyone — white, indigenous, black, young and old — to work together to make the country a better place, not least for those who were on the land first. Sandmann wants us to believe that he was merely a silent, innocent bystander during the confrontation. But the hat he was wearing spoke hate. CORRECTION (January 23, 2019, 3:45 p.m.): An earlier version of this article misspelled the surname of the author of “Alt-America: The Rise of the Radical Right in the Age of Trump.” His name is David Neiwert, not David Neiwart.